When George Schweitzer was researching CBS's coverage of the very first Super Bowl as part of his preparation for the network's Super Bowl 50 marketing campaign, he made note of a Washington Post article from January 1967. "It said in the TV column, 'CBS is pulling out all the stops and promoting this game all over, using their celebrities,'" said Schweitzer. "And I was imagining, what were 'the stops' in 1967?" Whatever they were, they don't come close to the exhaustive, yearlong marketing effort Schweitzer, the president of CBS Marketing Group, and his team have concocted as they try to attract as many viewers as possible for Sunday's Super Bowl telecast. "We were there for the first one in 1967," he said of Super Bowl I, which was jointly televised by CBS and NBC. "Since then, it has really transformed into a national day of celebration." And CBS is hoping the game's 50th year will yield its biggest celebration yet. "This one is very special," said Schweitzer, who is working on his sixth Super Bowl for CBS. "The Super Bowl is the singular biggest event in our culture, in our business, in the mainstream, in everything. It has so many moving parts beyond the game. What we've learned over the years is how to activate all those other moving parts, because it attracts, obviously, people who don't watch a football game all year long." 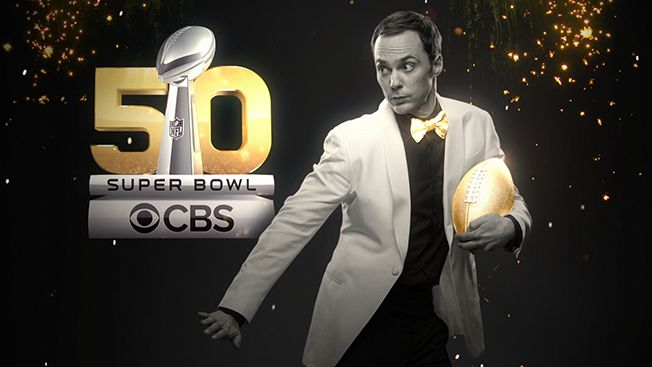 Because of that, CBS didn't waste any time in starting to promote Super Bowl 50. The network rolled out its very first promo last Feb. 2, just one night after NBC aired last year's Super Bowl (which drew 114.4 million viewers), and debuted the network's manta for the coming year: "We were there for the first. We'll be there for the 50th." "That was what I would call a 'plant the flag' kind of spot," said Schweitzer. "Once the other one was over, we established CBS immediately as the home of the 50th." Taking his cue from the traditional 50th anniversary color, Schweitzer's team created a campaign that seemed to bathed in gold. "We've embraced it in a big way," he said, "because we think it helps achieve what we want, which is to turn this into more than the event itself, and make it look like it's very coordinated and cohesive on CBS. And that went from not just the network, but our local stations, our O&O [owned-and-operated] stations, our affiliate stations, our 120 radio stations, all of our online and streaming services. Anything that isn't nailed down around here is part of our gold celebration." For the Super Bowl 50 campaign, the network shot around 40 of CBS's prime-time, news and sports celebrities in various football scenarios and traveled to a smelting plant in California, where it photographed molten gold getting poured into a mold, using that footage for promotion. The gold motif extended to CBS's fall campaign, so= even when the network wasn't specifically promoting the Super Bowl, it retained those promos' key elements. On Dec. 19, exactly 50 days before Super Bowl 50, "we turned the network completely gold," Schweitzer said. "We bought in 100 percent. We had so much integrated promotion that there's no way I could quantify it," said Schweitzer, who estimates that the network ran "hundreds and hundreds" of Super Bowl promos. To link Super Bowl 50 to the very first Super Bowl, Schweitzer wanted to incorporate CBS promotional elements from that original game. "We don't have too much left from 1967, but we do have a vault under a mountain somewhere in Pennsylvania where they keep all the original stuff that they could find," he said. That's where they found the elements that they used for this promo for "The NFL-AFL Super Bowl," which uses footage from The Jackie Gleason Show, which aired the night before. Gleason urges viewers to watch the Super Bowl the following day, adding, "It's going to be murder." On Saturday night, CBS will run the Gleason footage in its entirety. "We love tapping deep into the mine of history here, because we have so much of it," Schweitzer said. "This will be our 19th, which will be one more than anyone else. We're proud of our legacy." Schweitzer's marketing team also crafted promos spotlighting each decade of the Super Bowl and linking the events of each time to changes in the game. "That's part of our goal to marry the history of the game with the growth of the country," he said. "The '60s was a turbulent time, a lot of social unrest, a lot of political unrest, that's when it all started. Each decade, we felt we'd set the tone of history and the Super Bowl game has gone through a lot of change." For the first time this year, CBS ran a promo linking three major events: the Super Bowl, the Grammys (which air Feb. 15) and the post-Super Bowl telecast, which this year is The Late Show with Stephen Colbert. In the spot, Jim Nantz, Phil Simms and the rest of the CBS's Super Bowl crew meet up with Rihanna on a football field, as "referee" Colbert flips a coin to determine which show will air first. "This is Halley's Comet—this is once in a lifetime," said Schweitzer of the promo. "I'm not going to be here for the 100th, but I'm here for the 50th. So we're doing everything now. We have these two incredible events within eight days—the Super Bowl 50 and the Grammys—both golden events. We also have the live late-night show right after the game, which has never been done before. So we used that as an opportunity to involve three teams." Once the two Super Bowl teams—the Denver Broncos and Carolina Panthers—were set last week, Schweitzer had "the final layer upon the whole campaign. And so we will have our spots for the game itself, which is a giant Peyton Manning and a giant Cam Newton, among all the gold and special effects of the Golden Gate Bridge, etc. But that is the storyline: America loves rooting either way, for the cerebral veteran or the new, young kid." In this final week leading up to the game, CBS is doing live cut-ins every night at 8 p.m., spending one minute to highlight various Super Bowl events and build anticipation for Sunday's game. "How do we signal to our audience that we believe this is extra special?" Schweitzer said. "It's a one-minute thing—regular entertainment programming will follow, but it's a way to solidify it's something special that no other network or broadcast has ever done." The network is also airing four prime-time specials prior to its 13-plus hours of Super Bowl Sunday programing: Super Bowl's Greatest Commercials, which aired last night, Super Bowl's Greatest Halftime Shows on Friday, and Super Bowl's Greatest Commercials All-Star Countdown on Saturday, followed by the 5th Annual NFL Honors telecast. There's one final piece of Schweitzer's Super Bowl-related promo campaign that's still under wraps: which shows he'll spotlight during the network's in-game promos. "Locked in a secret drawer is the ever-changing list of what will or will not be promoted in the Super Bowl," he said. The network is always tight-lipped about its promo choices, which can lead to surprises like the 2010 Super Bowl promo for Late Show with David Letterman featuring Letterman watching the game with Oprah Winfrey and rival Jay Leno. Despite the secrecy, Schweitzer said people "can assume" the lineup will include promos for the Grammys, the network's top shows, Colbert and James Corden's post-Super Bowl shows, big sports events like the Masters and the NCAA Tournament, and "plenty of representation from CBS's different dayparts, like news and sports and entertainment." What will Schweitzer and his CBS marketing team do once their yearlong Super Bowl 50 campaign concludes on Sunday? "I'm passing out!" he said. "I go into rehab on Monday!"